BALTIMORE (CNS) — As he helped distribute 1,000 coats to West Baltimore children Nov. 30, Baltimore Archbishop William E. Lori reflected on the church’s presence in the neighborhood that saw the final arrest of Freddie Gray Jr. and bore the brunt of the unrest that followed his death last spring. 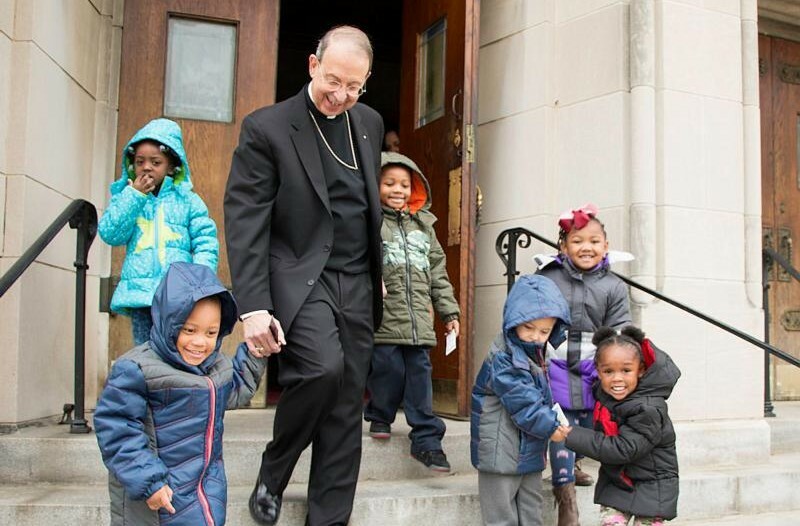 The 1,000 coats — donated through the work of the Knights of Columbus, for whom Archbishop Lori serves as supreme chaplain — were distributed to children from Catholic Charities Head Start of Baltimore City, Ss. James and John Catholic School, Holy Angels Catholic School and Alexander Hamilton Elementary School, all in Baltimore. Children lined up in the parish hall at St. Edward to receive their new coats. “It’s a blessing; I’m telling you,” she told the Catholic Review, the news outlet of the Baltimore Archdiocese. “There’s nothing like a warm coat for the winter, and it means a lot to our families that there are people outside of the neighborhood that support them,” said Mary Gunning, director of Catholic Charities Head Start of Baltimore City. Stephen Cohen, state deputy for the Knights of Columbus in Maryland, said Coats for Kids is a national program for the Knights. The Knights raised enough money throughout Maryland to purchase 500 coats; their Supreme Council added another 500. As noted by Archbishop Lori, the coat giveaway is one of several ways the church has intensified its presence in Sandtown-Winchester. In the summer, the Archdiocese of Baltimore donated $100,000 to YouthWorks, the city’s youth jobs program, providing funding for more than 60 summer jobs. Catholic Charities has expanded Head Start programs from nine to 15 locations, now serving 700 children and families, up from 267. A new employment hub, based at St. Edward, will assist local residents in attaining certification to work as automotive technicians, with the goal of placing 50 in jobs in the program’s first year. William McCarthy Jr., executive director of Catholic Charities, added that St. Edward also has established a food pantry that provides residents with sustenance but also the services of a caseworker, who can help secure other necessities, such as housing. “All this on this little corner of Poplar Grove and Lafayette,” McCarthy said, noting that he once played basketball as a middle-schooler in the St. Edward gymnasium where the local kids were trying on their new coats. In the works is a plan to open a gym to offer structured afterschool activities, McCarthy added. Zygmont is on the staff of the Catholic Review, the website and magazine of the Archdiocese of Baltimore.